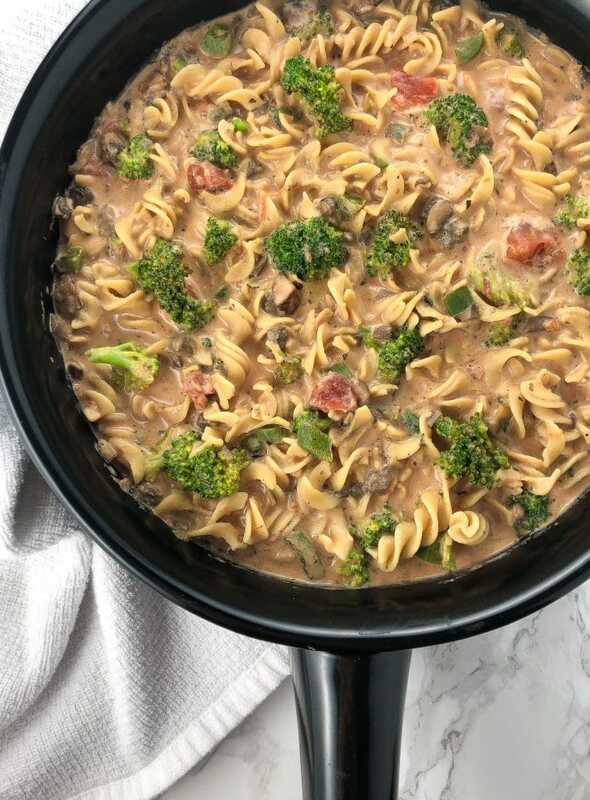 This easy recipe is healthy comfort food in a skillet! The dairy-free sauce has become a favorite in our house as it tastes like a healthy version of vodka sauce! It’s a creamy sauce we can feel good about eating because it’s made with good fats. 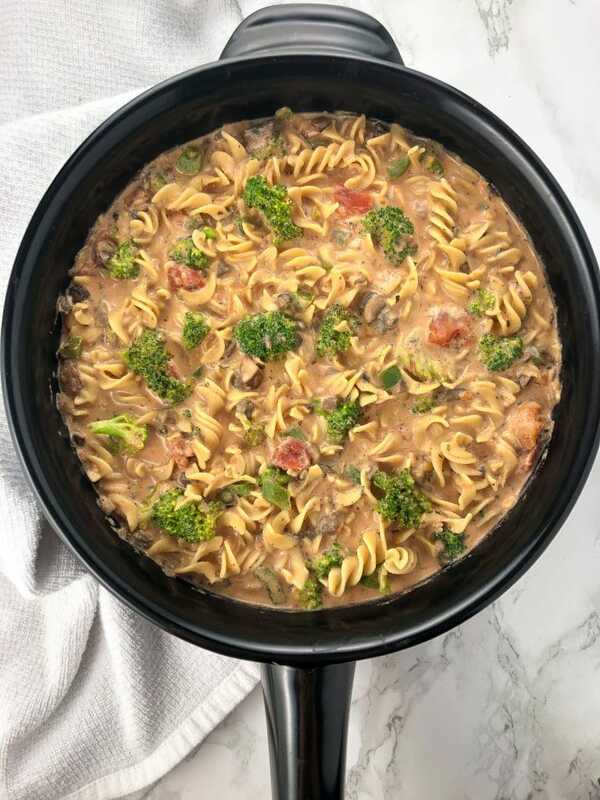 This dish is packed with nutrients and can be customized to your liking by using your favorite pasta and veggies. 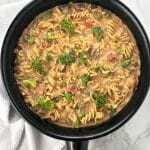 I love using shells or rotini in this recipe. I make this pasta dish healthier by using a bean or lentil pasta. These pasta alternatives, which come in all different shapes, are better for us because they are packed with plant-based protein and fiber. One serving of this dish can have up to 20+ grams of plant-protein! Another good thing about these gluten-free pastas is they don’t spike our blood sugar like a wheat or rice based pasta. Always make sure to read the ingredients on pasta boxes. The best kind to buy only have one or two ingredients which should be whatever bean or lentil was used to make the pasta. To make it even healthier you can always use spaghetti squash or veggie noodles like zoodles. If you don’t have a high speed blender, like a Vitamix, the cashews must be soaked for at least 2 hours in warm water before making the cashew cream. Get the pasta started first and, while that’s cooking, make the cashew cream with the soaked cashews. Feel free to sub any veggies you like in this recipe. I have made this with both fresh and frozen broccoli and cauliflower. 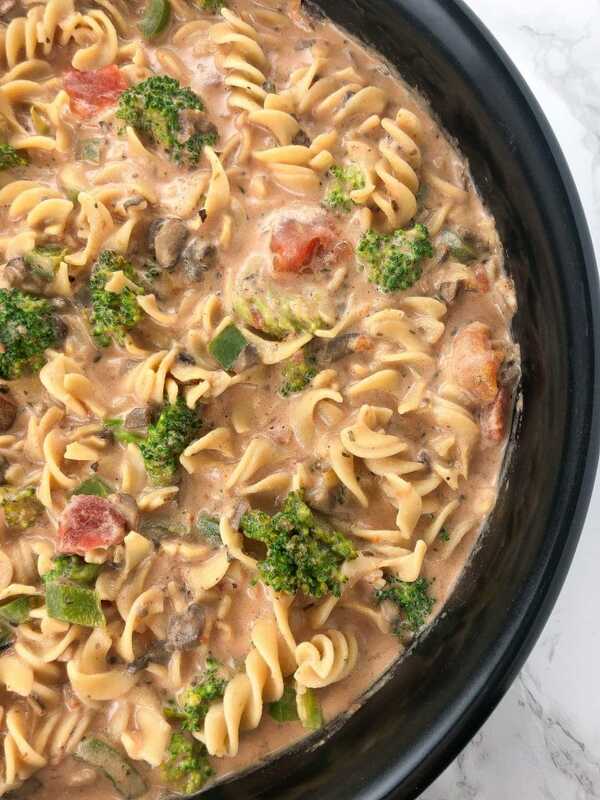 We actually prefer frozen over fresh for this dish, which makes things even easier! The cauliflower cannot be detected as much as the broccoli, but we love it both ways. As always, I don’t add a ton of salt to my recipes, but if you need more, feel free to add it! Enjoy! I’d love to hear how you liked it or any substitutions you made in the comments below. This dairy-free pasta dish makes an easy weeknight meal that checks all the boxes. It's packed with plant-protein, healthy fats and veggies! Healthy comfort food that will please even picky eaters! First, soak your cashews for the cream sauce. You want to place the cashews in a bowl and fill it with warm water, covering the cashews. Then, set it aside. If you have a high speed blender, like a Vitamix, you do not need to soak them that long, maybe 15 minutes or so. If you don't have a high speed blender I recommend soaking for 2 hours. First make your pasta according to the instructions it came with. After I drain the pasta, I put it back in the pot and fill with cold water to keep it from sticking while I get everything else ready. Once I'm ready to add the pasta, I strain it again. Next in a large skillet over medium heat, sauté the mushrooms and garlic for about 2 minutes. Then add the peppers and broccoli (or cauliflower) sauté for another 5-7 minutes. This can be sautéed with oil or splashes of water. 1. You can use other pasta sauce beside marinara. Thicker red sauces are better to use so it's not too runny. I even tried pizza sauce and it came out delicious. 2. Read last paragraph of blog post for tips.